Use File Downloader on localhost domain where it always works as a full version. Register a trial license key. This is a trial version. It can be used in evaluation process only. You can use File Downloader with a trial license key during the 30 days evaluation period only. The evaluation version of File Downloader neither puts any limitations on the number of files that can be downloaded nor constrains its functionality anyhow. So if the evaluation version does not work properly, we highly encourage you to create support case and tell us about the problem. 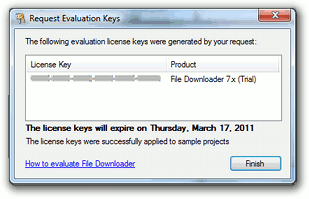 To request trial license key you should use Request Evaluation Keys tool which is distributed with the product. To launch this tool click the Start button, point to All Programs, and then point to Aurigma. Point to File Downloader 7.0.9 and click Request Evaluation Keys. If you downloaded File Downloader no setup archive ( FileDownloaderNoSetup.zip ) just unpack this archive and run the /RequestEvaluationKey/RequestKeyOnWindows.exe file. Then enter your E-mail and Password, you are registered with www.aurigma.com, and then click Request. After you request trial license keys they are automatically registered in all sample applications installed along with File Downloader. Then you can move these samples to your web server. If, however, you need to apply these keys to another application just paste them to this application as it is described in the Registering License Key section. 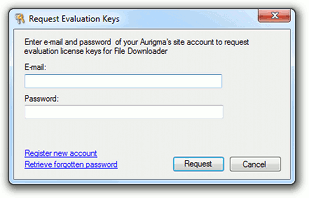 If you cannot obtain trial license keys using Request Evaluation Keys tool for some reason you can do it online (http://www.aurigma.com/account/licenses). No valid license key for current DNS/IP address specified. If you see this message contact site administrator. Allows using File Downloader with the domain name you specified during activation. The license key is generated for a fully qualified domain name, that is, it works neither with other domains associated with the same site nor with any subdomains of this domain. The only exception is the www subdomain. In other words, if you generate the license key for the yoursite.com domain, it will not be valid for subdomain.yoursite.com, but will be valid for www.yoursite.com. The domain name of the page which hosts the control and the domain name of the server from which file list is requested must reside within the same organization-level domain as the registered domain. For example, if you registered the files.yoursite.com domain, you can host File Downloader or request file lists form yoursite.com or any of its subdomains. Allows using File Downloader with all domains associated with the IP address specified during activation; available only in Premium edition.